Butch Hebert at the No Name Ranch, where he kept his horse Cheyenne. Photo by John Noltner. Butch Hebert is part of a rich and little-known tradition of Creole and African-American cowboys. His Louisiana ancestors experienced the terror of the Jim Crow era: one great-grandfather was lynched, and a grandfather was kidnapped and held as an illegal slave. The latter escaped and joined his brother in California, where he started his own cab company. A fan of Roy Rogers when he was a child, Hebert also noticed there were no black cowboys in popular culture. 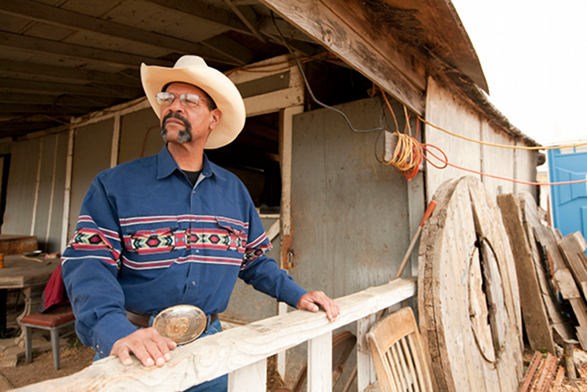 In his twenties, he met black cowboys in real life—and decided to become one himself. “I went whole hog into it,” he says, living in a tack room for six months as he studied how to handle horses. Over the past 35 years, he says, cowboying has taught him responsibility, patience, and fearlessless. In this outtake, Hebert talks about the intimate ways that a man and his horse communicate. Six months after our interview, his horse Cheyenne passed away.